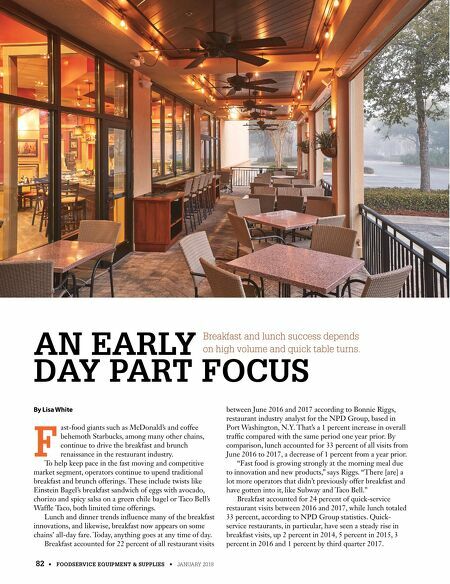 82 • FOODSERVICE EQUIPMENT & SUPPLIES • JANUARY 2018 By Lisa White F ast-food giants such as McDonald's and coffee behemoth Starbucks, among many other chains, continue to drive the breakfast and brunch renaissance in the restaurant industry. 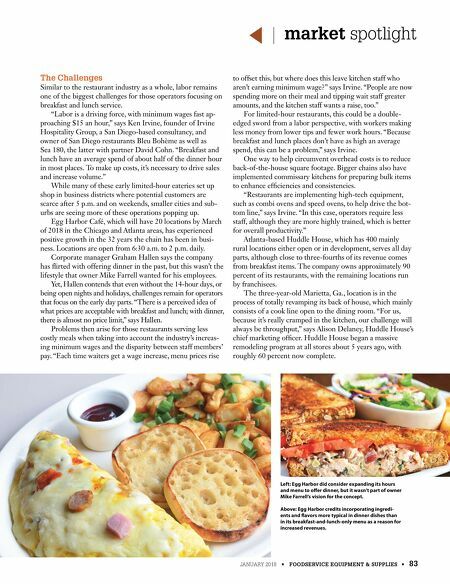 To help keep pace in the fast moving and competitive market segment, operators continue to upend traditional breakfast and brunch offerings. These include twists like Einstein Bagel's breakfast sandwich of eggs with avocado, chorizo and spicy salsa on a green chile bagel or Taco Bell's Waffle Taco, both limited time offerings. Lunch and dinner trends influence many of the breakfast innovations, and likewise, breakfast now appears on some chains' all-day fare. Today, anything goes at any time of day. Breakfast accounted for 22 percent of all restaurant visits between June 2016 and 2017 according to Bonnie Riggs, restaurant industry analyst for the NPD Group, based in Port Washington, N.Y. That's a 1 percent increase in overall traffic compared with the same period one year prior. By comparison, lunch accounted for 33 percent of all visits from June 2016 to 2017, a decrease of 1 percent from a year prior. "Fast food is growing strongly at the morning meal due to innovation and new products," says Riggs. "There [are] a lot more operators that didn't previously offer breakfast and have gotten into it, like Subway and Taco Bell." Breakfast accounted for 24 percent of quick-service restaurant visits between 2016 and 2017, while lunch totaled 33 percent, according to NPD Group statistics. Quick- service restaurants, in particular, have seen a steady rise in breakfast visits, up 2 percent in 2014, 5 percent in 2015, 3 percent in 2016 and 1 percent by third quarter 2017. AN EARLY DAY PART FOCUS Breakfast and lunch success depends on high volume and quick table turns.